Hope is a single mother. She raised her twins, Joshua and Susan, mostly by herself. She became pregnant at seventeen and thought she and Nick shared something special, but Nick let her down and she had no choice but to move and start over. She made a life for herself in Tranquility Bay and never thought she'd see Nick again. However, when her son's life is in danger she calls him and asks for his help. Nick is a famous race car driver. He's won many prizes and has achieved almost all of his goals, but when Hope calls him he feels he's missed something. They didn't keep in touch when he left her behind all those years ago and he didn't know Hope was pregnant. To his surprise he's the father of two teenagers and wants to be part of their lives. To be able to give Joshua a chance Hope and Nick need to patch things up. Will they be able to make amends for the sake of their son? Boardwalk Summer is an impressive emotional story. Hope is a sweet woman. She does everything for her kids and fights for them in any way she can. Her strength and dedication are admirable and that's something I loved about her character. She managed to deal with the heartbreak of the past and has given her children a good and warm home filled with love. I liked this heartwarming part of the story a lot. Hope has such a beautiful personality and that gives Boardwalk Summer a wonderful warm atmosphere. Nick is a kind and determined man. He once was really poor and had a bad reputation, but he managed to make something of himself and now he's rich and famous. Status isn't everything though and he finds out how much he's missed when Hope invites him back into her life. He has some tough choices to make and realizes that money isn't everything. He still has a lot to learn and discover and being with Hope and the twins broadens his horizons. There are plenty of unresolved feelings between Nick and Hope and I couldn't wait to find out if they'd manage to make things right. Kimberly Fisk writes about difficult subjects in an honest empathic way. Her main characters are going through something awful, but they never lose hope. They're realistic, but stay optimistic at the same time and I liked that attitude a lot. Boardwalk Summer is a moving story with plenty of different layers. The main characters are struggling, but they're making progress as well and I loved to see them grow. Kimberly Fisk balances this with loving and romantic scenes, which gives her story a good balance. 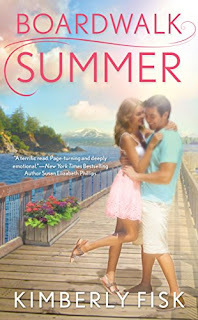 Boardwalk Summer is a terrific story and I enjoyed reading it very much. If you love emotional romantic stories Boardwalk Summer would be an excellent choice. I love the sound of this book. I will have to check it out. Thanks for the awesome review. Thank you for the review. I loved the post and will look at the bok. This sounds like a second chance romance. I hope it is. Something to bring to read during long queues. Gosh, imagine finding out that you had twin teenage boys! It sounds like a lovely story about 2nd chances. I love second chance stories and I'm definitely going to check this one out.